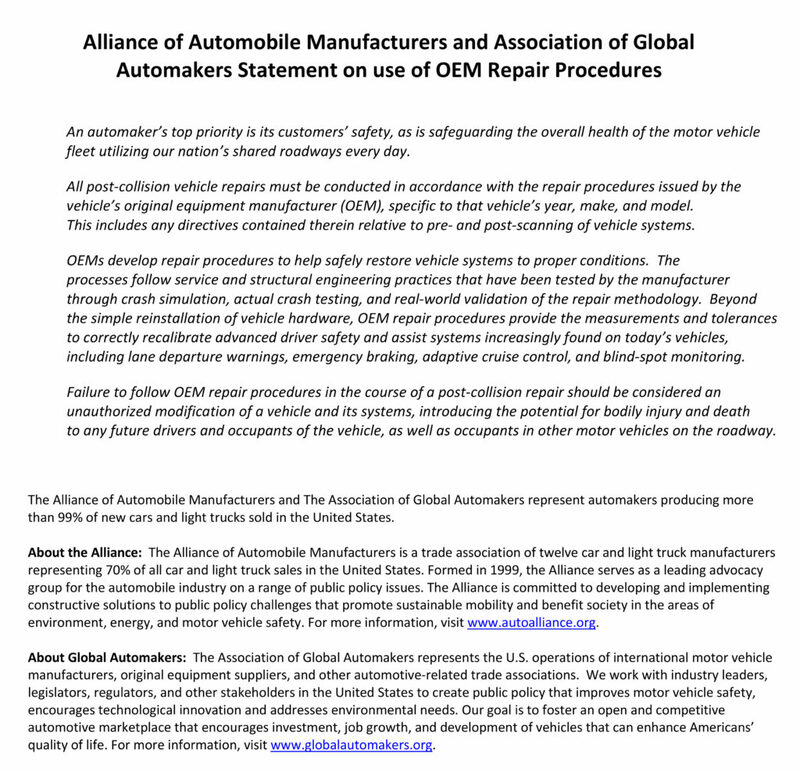 The Alliance of Automobile Manufacturers and Association of Global Automakers this month declared that all “post-collision vehicle repairs” must follow OEM repair procedures. The policy statement by the two trade groups — who represent 99 percent of U.S. new car and light truck manufacturers — formally aligns automakers with the stance held for nearly a decade by the three national collision repair trade groups and I-CAR. It also matches what courts have supported — perhaps most notably with the $31.5 million 2017 John Eagle Collision verdict (later settled for an undisclosed amount). “An automaker’s top priority is its customers’ safety, as is safeguarding the overall health of the motor vehicle fleet utilizing our nation’s shared roadways every day,” the joint statement declares. “All post-collision vehicle repairs must be conducted in accordance with the repair procedures issued by the vehicle’s original equipment manufacturer (OEM), specific to that vehicle’s year, make, and model. This includes any directives contained therein relative to pre- and post-scanning of vehicle systems. “OEMs develop repair procedures to help safely restore vehicle systems to proper conditions. The processes follow service and structural engineering practices that have been tested by the manufacturer through crash simulation, actual crash testing, and real-world validation of the repair methodology. “Beyond the simple reinstallation of vehicle hardware, OEM repair procedures provide the measurements and tolerances to correctly recalibrate advanced driver safety and assist systems increasingly found on today’s vehicles, including lane departure warnings, emergency braking, adaptive cruise control, and blind-spot monitoring. 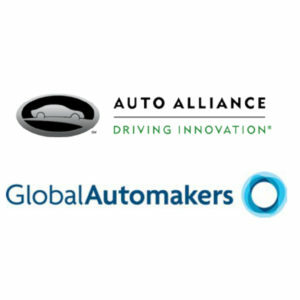 The Auto Alliance’s membership includes BMW, FCA, Ford, General Motors, Jaguar Land Rover, Mazda, Mercedes, Mitsubishi, Porsche, Toyota, the Volkswagen Group and Volvo. Global Automakers includes Aston Martin, Ferrari, Honda, Hyundai, Isuzu, Kia, Local Motors, Maserati, McLaren, Nissan, PSA, Subaru, Suzuki and Toyota. Global Automakers noted Wednesday that repair procedures were accessible. Most members allow anyone to obtain online a copy of the instructions to fix their vehicles with either a short- or long-term subscription. The Automotive Service Association and Auto Alliance have planned to pursue OEM repair procedure legislation this year.